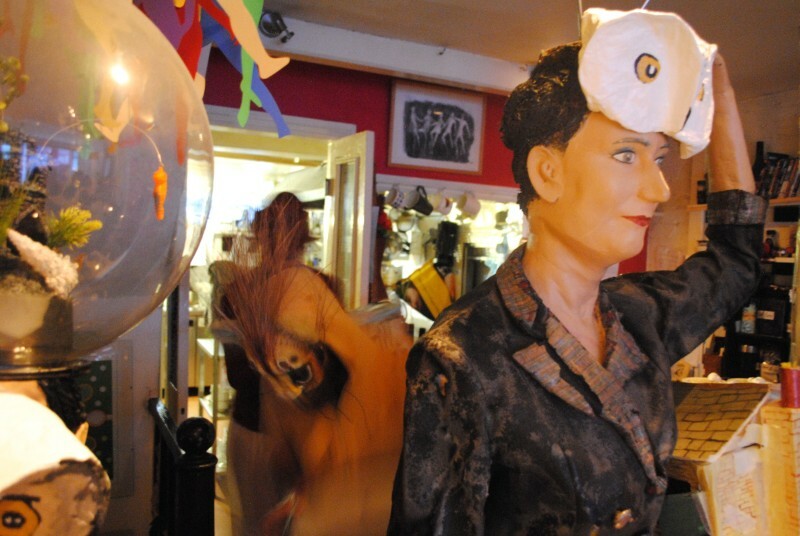 Bom-Bane’s performance café is a Brighton institution in miniature, and previous Festival shows have been themed around palindromes (2015’s Saippuakivikauppias) and the city’s lost Wellesbourne river (in 2014). This is an immersive happening taken to extremes, from the soundtrack when you enter to the décor on the banisters, to the little nested quails eggs on the tables. It crams big ideas and big things into tiny spaces and for 45 minutes we are in a strange, magical world. And what’s that awful honking noise – is something in pain? The animals’ songs are beautifully matched to character and vary in tone – some twinkle, some honk – accompanied by small instruments: ukulele, toy piano, penny whistle. Costumes and settings have a lovely hand-made aesthetic and a highly imaginative use of materials. There is puppetry, poetry, visual jokes, and transformations as the menagerie gathers together and with their help Jane finds her voice and her skin. Lyrics (by Jane Bom-Bane and Eliza Skelton) are meaningful and clever, the performances beguiling and there is so much to look at that it seems to be over too quickly, rather like a fairground ride that whips you through a haunted house before you’ve had time to scream. I wanted to do it all again straight away. Instead it’s meal-time which is always a treat here. Strange that most diners happily eat the animal option (did they learn nothing?). I have the veggie choice, a swan sculpted from filo pastry. There’s a meringue snail to follow. Bom-Banimals is perhaps a touch lighter in content than previous Bom-Bane’s shows, but the effect is just as enchanting. We end feeling properly at home with the Bom-Bane Family Players (Jane Bom-Bane and Eliza Skelton are joined by Foz Foster, Kate Daisy Grant, Raven Kaliana, Jo McDonagh, Sebas Contreras, Kate Vaughan, and Tom Walker) and rather reluctant to leave.